Based on the GM dashboard interface guidelines, I designed this contextual auto interface to imagine what the first socially intelligent driving experience might be like. The car has become a technology platform of its own, and car owners are beginning to expect the driving experience to be much more than just transportation. They expect technology to augment each experience to maximize productivity an enjoyment. This concept artwork was created to demonstrate what a social operating system might look and work like in today's automobiles. Auto brands tend to debut new features in their luxury models before they become standard (e.g. seat heaters and onboard Wi-Fi). I chose to feature the XTS for that reason as well as Cadillac's commitment to advancing the software as much as the hardware every year. The concept design work began by carefully studying General Motors' entire user interface guidelines. We valued the realism of the concept interface, and compliance with the limitations of the system it would live in. The color palette was developed with safety as the highest consideration. During the day, the brightness of the text on the screen is legible in the high-contrast interface, and during the night the dark palette prevents blinding or distracting lights from the dash. 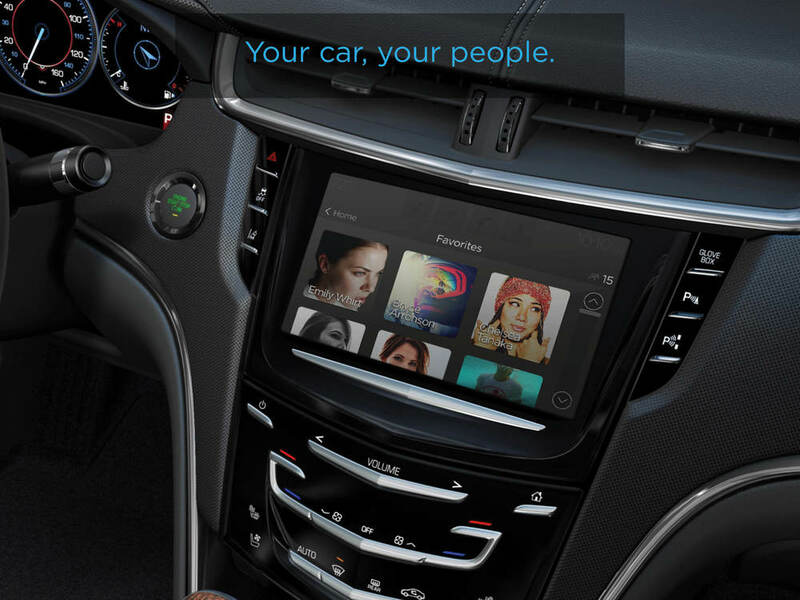 Instead of adjusting the size of the Humin interface for a Cadillac, it was important for this tool to be tailored for the driving experience. It was an exercise in imagining what was possible for the next generation of dashboard technology, and focusing on features that make navigation & communication simpler.